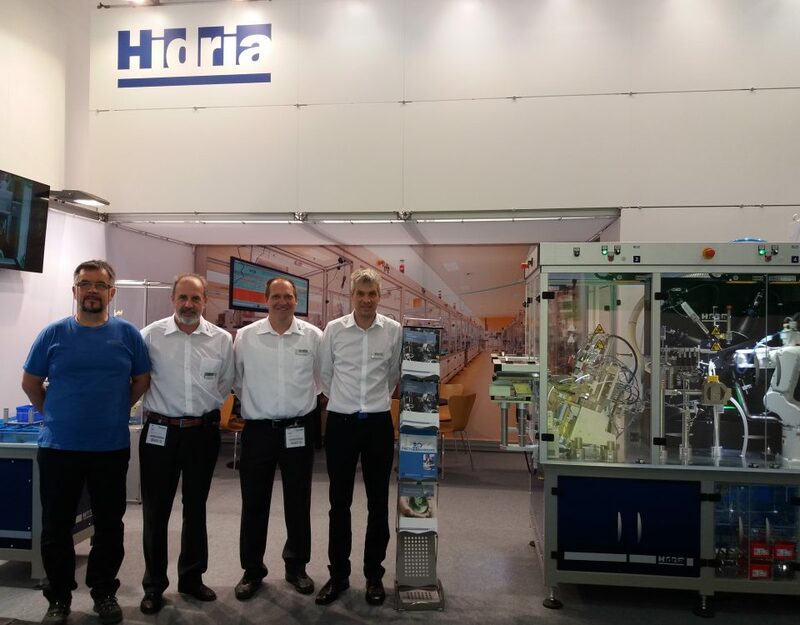 In August 2018 the final Beta version of the FACTS4WORKERS shop-floor user-interface solution was successfully installed at the Hidria Dieseltec production lines in Tolmin, Slovenia. The solution’s final version internally known as the Hidria Knowledge Management System is currently undergoing a series of tests and shall be fully operative in November 2018. The FACTS4WORKERS solution is very adaptable and modular; it is currently being used on two full automatic lines and one manual machine. In the next month expansion on three additional automatic machines/lines is planned. 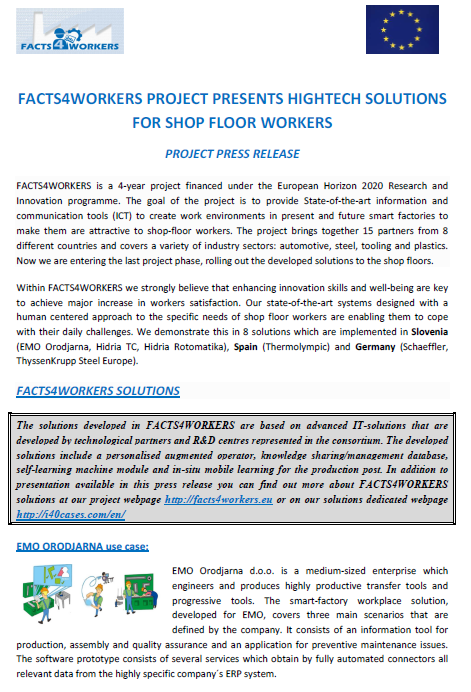 The purpose of the FACTS4WORKERS solution – software being mostly developed by University of Firenze with hardware compatibility issues being addressed by Evolaris and employees’ satisfaction analysis provided by ITAINNOVA – vastly improves the work performed at the company shop floor. 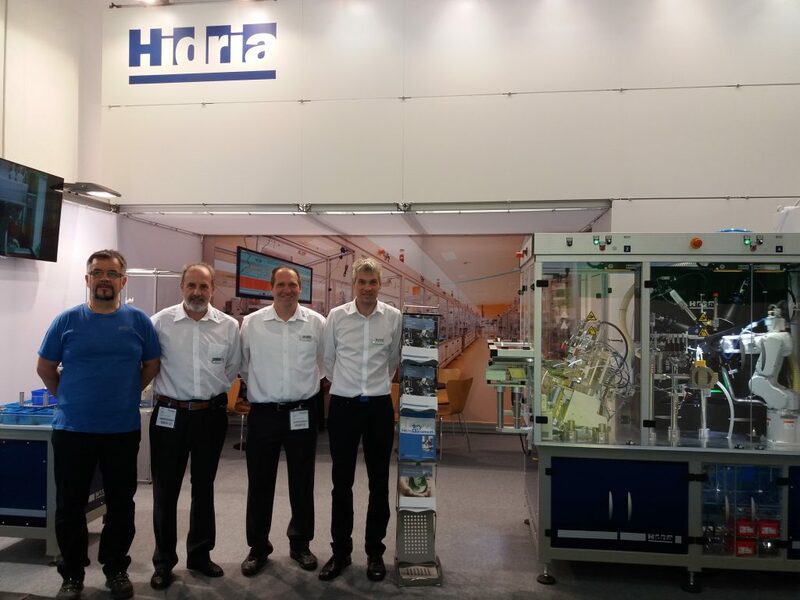 The FACTS4WORKERS solution presented at the Hidria Dieseltec plant is a use-case involving an already highly automatized production process. The Hidria Dieseltec business unit manufactures glow plugs for light and heavy-duty vehicles for the European automotive industry. In addition the FACTS4WORKERS development partners needed to take into account the already operating lines – all manufactured in-house – together with their software and hardware specifics. The FACTS4WORKERS solution addresses issue of improving working conditions for manufacturing line operators and technicians and maintenance staff. The final solution enables the workers to insert errors and faults that might occur during the process. It significantly eases solution of rarely occurring mistakes whose solving process can be quickly forgotten. 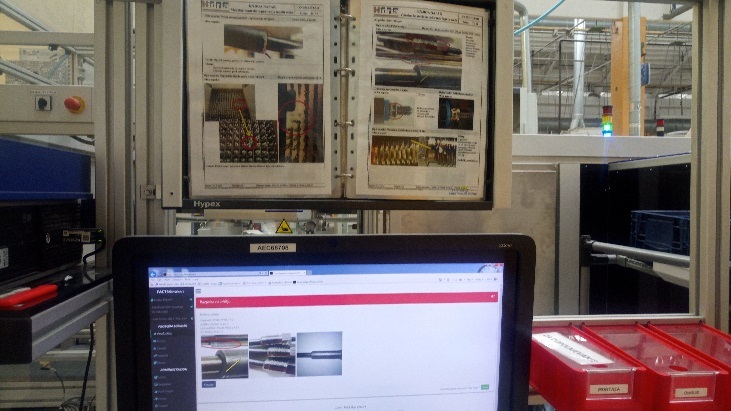 The solution upgrades the current paper-based error data sheets at a separate shop floor workplace being replaced with a fully electronic database. “The solution enables different options: 1) different logging in options (line operator, worker , leader, maintenance staff) 2) database filtering function 3) a special database pre-filtering function that gives the user the best possible solution by looking at its login data (worker, leader, operator) 4) database search function 5) solution provider”. Industrial partner Hidria aims to use the developed FACTS4WORKERS solution in operator education processes. Each line operator can access knowledge provided to him by his most experienced peers on the line. The FACTS4WORKERS solution also greatly eases the maintenance staff’s work who can now acquire instructions from previous tool maintenance/change processes on the line. © 2016 FACTS4WORKERS. All Rights Reserved.